Push the “DISPLAY” button to displaythe “Display” screen. Weakens the contrast of the screen. BRIGHTNESS “+”: Brightens the screen. BRIGHTNESS “–”: Darkens the screen. The screen turns off when you touch the“SCREEN OFF”. To turn the displayscreen back on, push any bezel switchsuch as “INFO”, etc. The selected screenappears. Depending on the position of the headlightswitch, the screen changes to theday mode or night mode. To display the screen in the day modeeven with the headlight switch on, touch“DAY MODE” on the adjustment screen forbrightness and contrast control. However, if the km/h or MPH button is on,mode switching cannot be done. It remainsin the day mode. In this case, “DAYMODE” is not shown on the screen. 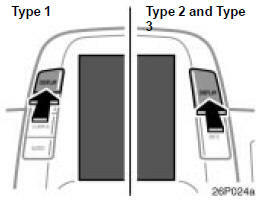 If the screen is set in the day mode withthe headlight switch turned to on, thiscondition is memorized in the system evenwith the hybrid system turned off.